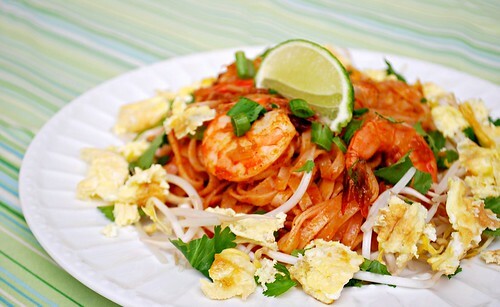 I'm anxious for lunch since leftovers are going to be this pad thai! There's a bit of heat in this dish but if you're not a fan of spicy heat, you can decrease the amount or omit the sriracha all together. I love how easy this was to prepare - no need for any bottled pad thai sauce. The secret to a good pad thai sauce is having the right balance of sweet, spicy, salty and sour... which this recipe has! While water comes to a boil, combine brown sugar, soy sauce/tamari, fish sauce, lime juice and Sriracha in a small bowl, set aside. In a large skillet or wok over medium-high heat, add oil to pan. Add beaten egg and cook through. Remove from pan and set aside. Add to the now empty skillet the green onion, shrimp, and garlic; stir-fry for 2-3 minutes or until shrimp is slightly pink. Add cooked noodles to the pan and toss to combine. To serve, divide noodles among 4 plates and top each serving with 1/4 cup bean sprouts, cooked egg and garnish with cilantro, green onions and lime wedge. We are big fans of Sriracha around our kitchen so I am sure that this will be a big hit when I make it for the family. The recipe sounds to good to have any leftovers for lunch the next day, How did you manage that? I fell in love with Pad Thai while we were in Hawaii! I can't wait to make this! I love a spicy pad thai. The flavors in yours looks perfect. Bring on the Thai food.